All students are trained in academics and are carefully guided in character. From the lower grades, students are taught and monitored closely in a small group setting through classroom teaching. As they progress, the students develop in self-management and master individualized learning. The students are motivated with positive reinforcement such as weekly Green Dot Treats, fortnightly Congratulation Slips, quarterly Honour Roll, and annual awards. A wide range of CCA programmes are organised on a weekly basis for our students. These train students in Academic Enrichment, Sports, Arts, Music, Performance and Life-skills. These programmes also prepare students for their participation in Regional and International Student Conventions. These conventions are platforms where students emerge as future leaders. 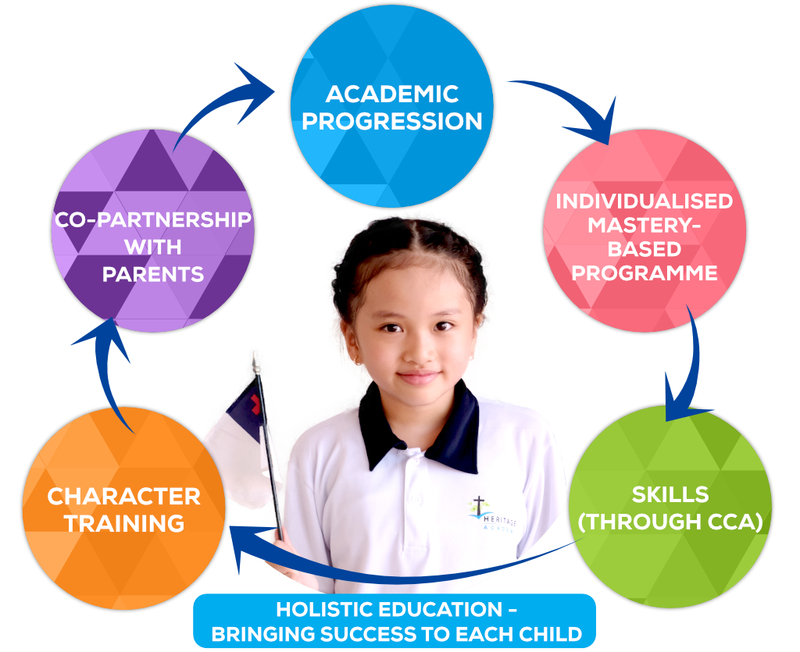 Character development is an integral part of academic and non-academic programmes. The HERITAGE values are emphasized on a daily basis through our staff and student interaction. Chapels and character trait lessons are conducted weekly to inculcate godly values in our students. Community Service Projects are the practical applications of the values they have learned. The close partnership of school and parents is critical to the successful development of each child. Parent orientation, workshops, and parent volunteering are some of the opportunities available to grow this partnership. This holistic programme trains Heritage Academy students to become all rounded youths, ready for the future.